You want to choose the best toothpaste for your children so they have healthy smiles, but it can be confusing with so many products available. You should look carefully at the ingredients when choosing a toothpaste for your family. Sodium laurel sulfate, or SLS, is found in many personal care products, such as toothpaste, soap, shampoo, and lotion. It has been linked to allergies and sensitivities in some people and can cause canker sores to flare up or dry out the mouth. Avoiding toothpastes with SLS can reduce the risk of your children developing these problems. Sensitive teeth can be caused by hot, cold, sweet, sour, or acidic foods or beverages. Sensitivity can also be caused by brushing too hard, cavities, receding gums, gum disease, teeth grinding, age, plaque, and teeth whitening products. If your child has sensitive teeth, visit the dentist to pinpoint the cause and ask what kind of toothpaste he or she recommends. Fluoride helps prevent cavities, but it can be toxic if large quantities are swallowed. Young children are not able to spit out toothpaste and may swallow it because it tastes good. Use a tiny amount (size of a single grain of rice) until your child reaches the age of three. Xylitol is a good alternative that can help prevent cavities and prevent dry mouth and is harmless if swallowed. Choose a toothpaste that your kids will like. Many toothpastes come in fun colors and flavors for kids and have pictures of popular cartoon and movie characters. If your kids have a toothpaste they like, they will be excited to brush their teeth. Your kids should brush their teeth twice a day for two minutes. 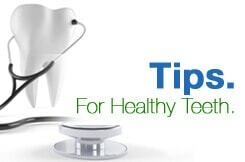 Replace their toothbrushes every few months or when the bristles begin to look worn out and don’t stand up straight. Help your children with brushing until they are able to do it well on their own and supervise them to make sure they do it every day for the right amount of time.